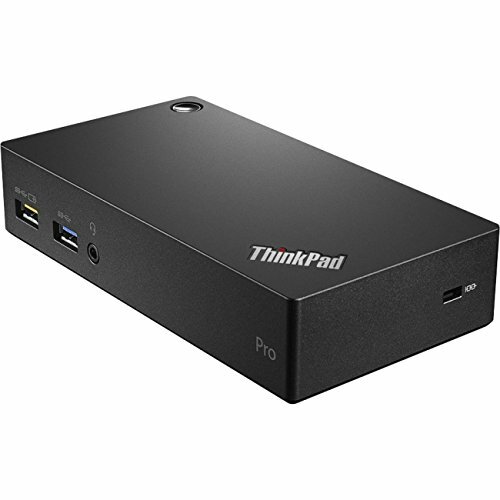 The Lenovo ThinkPad USB 3.0 Pro Dock connects to your system via an included USB 3.0 cable to provide you with two video and five USB ports as well as audio and networking capabilities. This dock comes with a DVI-I port and a DisplayPort to support up to two displays. For compatibility with legacy monitors, Lenovo has included a DVI-I to VGA adapter. To access your printers, scanners, external drives quickly, the USB 3.0 Pro Dock sports three USB 3.0 ports and two USB 2.0 ports. Accessing the network can be accomplished with the integrated Gigabit Ethernet jack. Furthermore, the dock draws power from the included 45W power adapter and comes with one always-on USB 3.0 port for charging battery-powered devices. 40A70045US USB3.0 Pro Dock In The Lenovo Factory Sealed Retail Packaged For USA. Item Contains A 45W ac adapter Which Does Not Charge The Laptop When Attached. Compatible with MIIX 520-12IKB, Lenovo B40-30, Lenovo B50-30, B40-30, B50-30, B50-45, B50-70, B50-80, V110-15ISK, V310-14ISK, MIIX 500, MIIX 520-12IKB, MIIX 510-12IKB, Miix 510-12ISK, Y910-17ISK, Yoga 3-14, 900 Professional Edition, 900-13, MIIX 700-12, MIIX 720-12IKB, 11e 1st Gen (AMD Windows), 11e 1st Gen (Intel Windows), 11e 2nd Gen (Intel Windows), 11e 3rd Gen (Clamshell Windows), 11e 3rd Gen (Yoga Windows), 11e 4th Gen Chrome, ThinkPad 13 (1st Gen) Chrome, ThinkPad 13 (1st Gen) Windows. Compatible With ThinkPad 13 (2nd Gen) Windows, E145, E220s, E320, E325, E330, E335, E420, E420s, E425, E430, E430c,E431, E435, E440, E445, E450, E455,E460, E465, E470, E475, E480, E520, E525 (AMD), E530, E530c, E531, E535, E540, E545, E550, E550c, E555, E560, E560p, E565, E570, E570p, E575, E580, S1 Yoga, S431, S440 S531, S540, L420, L430, L440, L450, L460, L470, L520, L530, L540, L560, L570, P40 Yoga, P50, P50s, P51, P51s, P70, P71, T430, T430s, T430si, T430u, T431, T440, T440p, T440s, T450. Compatible With T450s, T460, T460p, T460s, T470, T470p, T470s, T480s, T530, T540p, T550, T560, T570, TP25, Tablet 10 (2nd Gen), Tablet 8, ThinkPad Helix (1st Gen), ThinkPad Helix (2nd Gen), ThinkPad Twist S230u, X1 Tablet (1st Gen), X1 Tablet (2nd Gen), ThinkPad S1 Yoga 12, ThinkPad S3 Yoga 14, ThinkPad S5 Yoga 15, ThinkPad Yoga 14, ThinkPad Yoga 260, ThinkPad Yoga 370, ThinkPad Yoga 460, W520, W530, W540, W541, W550s, X1 Carbon (1st Gen), X1 Carbon (2nd Gen), X1 Carbon (3rd Gen). Compatible With X1 Carbon (4th Gen), X1 Carbon (5th Gen), X1 Yoga (1st Gen), X1 Yoga (2nd Gen), X131e , X140e , X230, X230 Tablet, X240, X240s, X250, X260, X270.